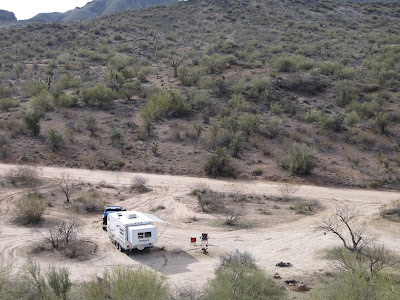 We just left our spot near Wickenburg, where we were "off the grid" for the last 5 days. It was intersting being disconnected that long. 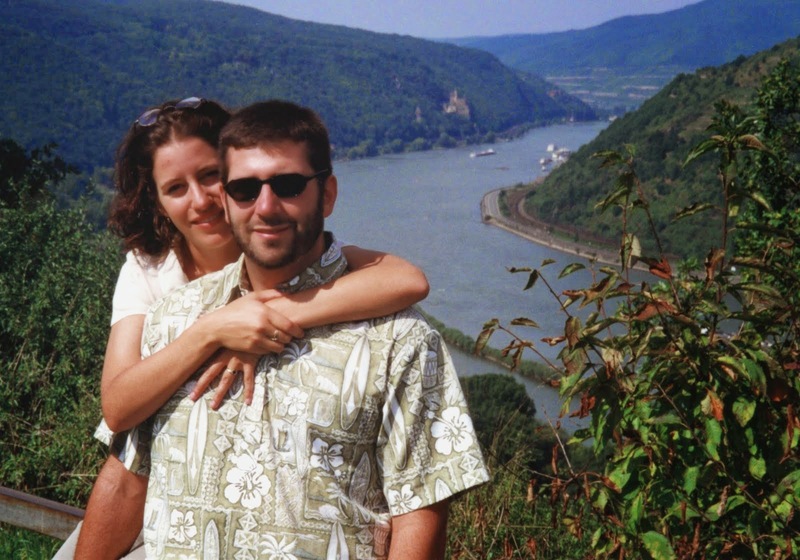 Some lessons we learned is that our batteries really are our limiting resource. At around 4am on the 4th night, the heater fans died and the temperature in the trailer got pretty chilly. Soon, I set up the generator to get the heaters and other necessities going. Here, Hilina has made a birthday party for all of her animals. Each has their piece of cake to eat! We knew we had one more night to go, so I ran the generator for about 4 hours in two different sessions and figured that would adequately recharge the battery to make it through the night. Unfortunately, that was not the case. The heaters died again about 4am. I had pre-set up the generator this time and simply cranked it on and let it run until about 8am so we could avoid the chilly morning. 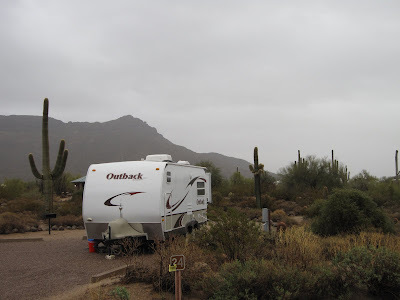 The lessons we learned with dispersed camping was that we need to manage our electricity use better and run the generator during times of high draw (such as showers that run the water pump). 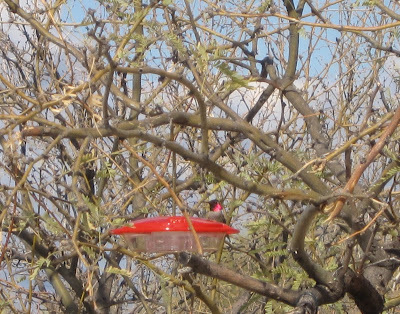 We set up a bird feeder and hummingbird feeder on a mesquite tree near the trailer and within 24 hours we had constant visitors to both. 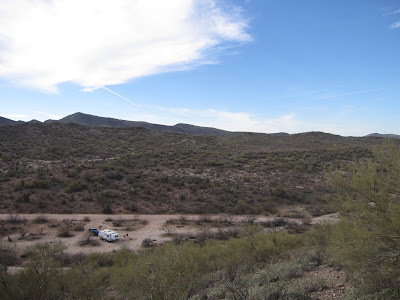 We have now moved onto Tonopah (about 45 miles west of Phoenix) to recharge the battery, dump and refill the fluids, and generally recharge. 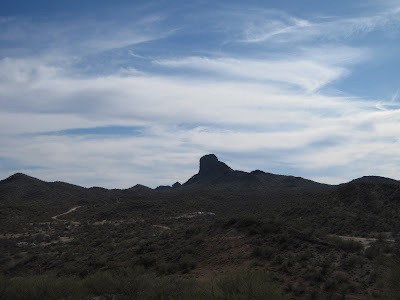 Then this week we head out to the Eagletail Mountains Wilderness for a few more days of dispersed camping. 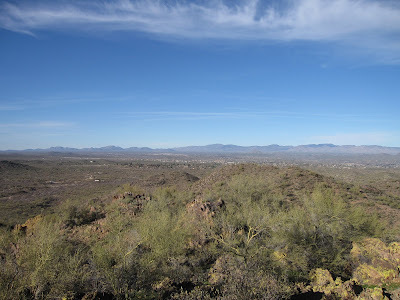 After the Eagletails, we'll head southeast toward Tucson. 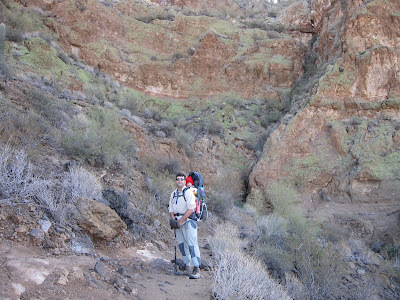 The Hassayampa River flows mostly underground from the mountains near Prescott all the way to the Gila River. 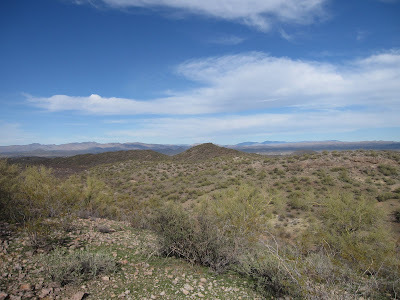 However, for a 5 mile stretch, as its aquifer is constrained between the Vulture Mountains and Wickenburg Hills, it flows above ground forming a magnificent and critically important riparian forest amongst the Sonoran desert landscape. 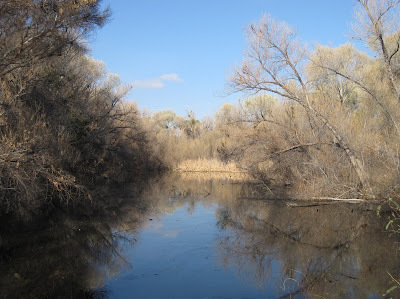 An important stretch of this river is protected by The Nature Conservancy as the Hassayampa River Preserve. 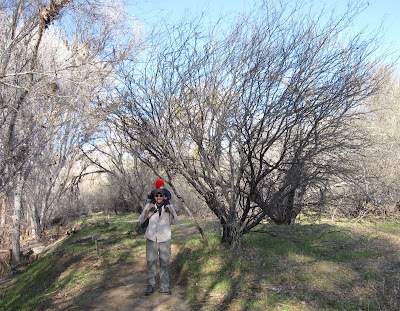 It is home to a verdant cottonwood/willow forest along the river and a mesquite bosque on the upslopes. 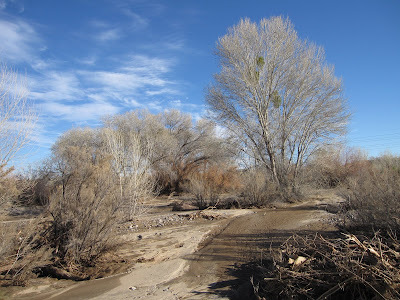 The big rains that happened a week ago caused a major flood on the Hassayampa. 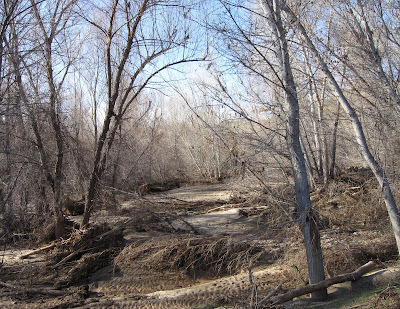 Instead of flowing a foot deep, it rose over 20 feet, covering most of the preserve trails with many feet of silt and changing the landscape of the riparian forest. 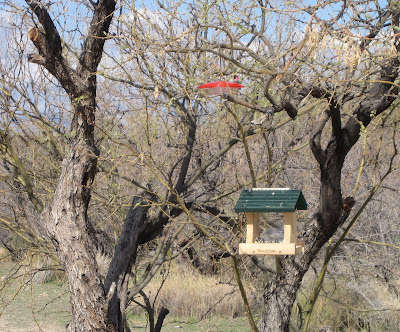 But, these tree species are adapted to this kind of catastrophic change. 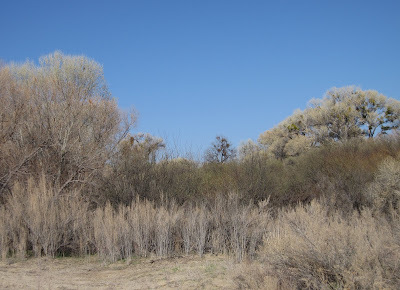 Cottonwoods grow very rapidly, resprout from disturbance readily, and will be back in no time. 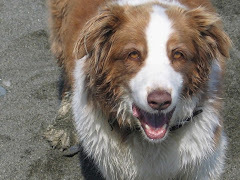 The same is true of most of these species and the new influx of silt will revitalize the soil nutrients. 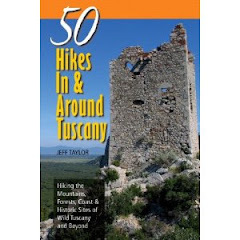 That being said, our hiking options were limited to the edge of the flood plain and to an adjacent pond due to the damage of fallen trees and silt covered trails. 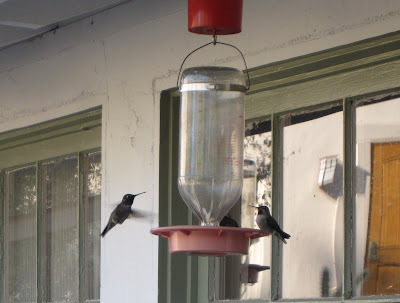 Nonetheless, we enjoyed our visit to the preserve. I know that this place will look extremely verdant when the sprouts come out in spring! 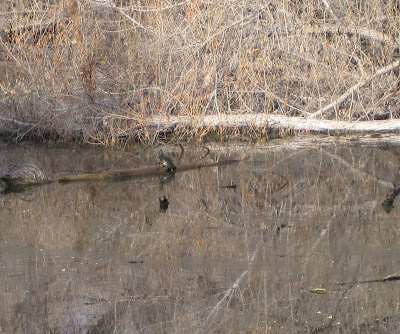 Native Sonoran Mud Turtle or Introduced Red-slider? Hard to tell from here. Do you want to know how strong that storm was that struck earlier this week? 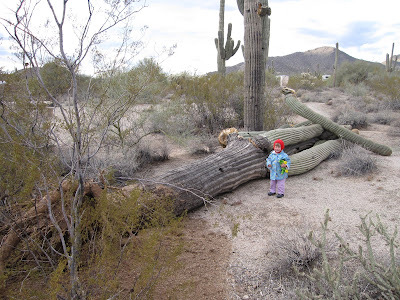 How about this 200+ year old giant saguaro that met its fate? 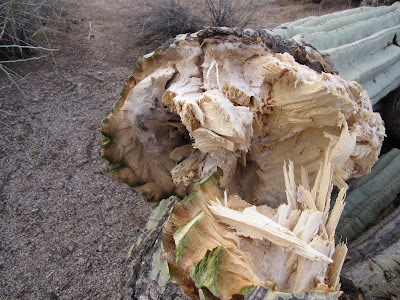 What is fascinating about this was this provided me the first ever opportunity to look inside a live/fresh saguaro to see what it looks like. 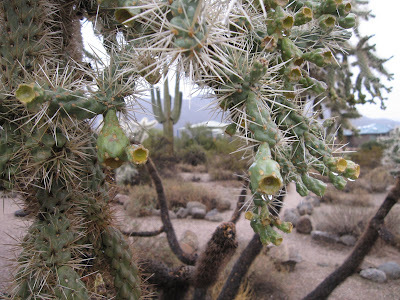 The inside of a saguaro is a moist, gelatinous, and pithy material. The solid "ribs" provide the structure that holds it together. 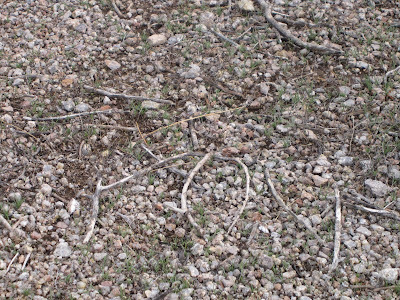 It looks woody in this photo, but really isn't. 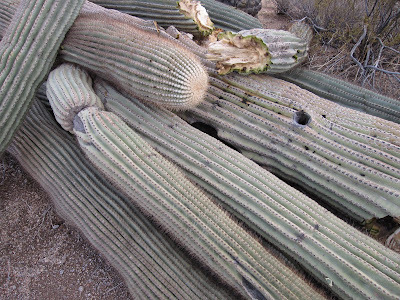 On the way down, this saguaro ripped the arms off a neighbor, resulting in a huge pile of cacti. 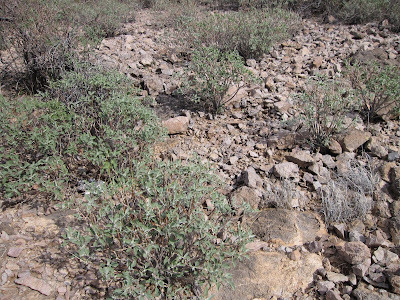 The effects of the rains are already obvious on the desert floor. A thin green carpet has suddenly appeared as herbaceous seeds have sprouted in profusion. This picture was taken less than 48 hours after the storm. Today, the carpet is significantly denser. 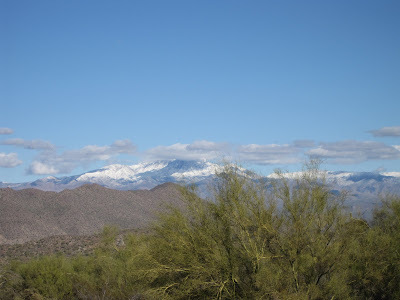 The storm left huge quantities of snow in the mountains above 4000 feet. 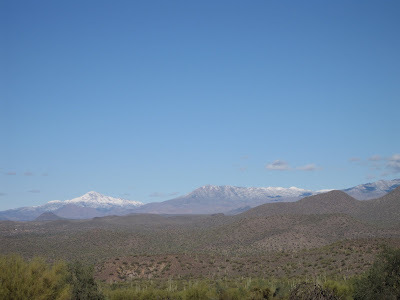 Here you can see 7000 foot Mount Ord in a blanket of the white stuff. This snowpack should be good for the high elevation forests who have suffered from recent droughts. 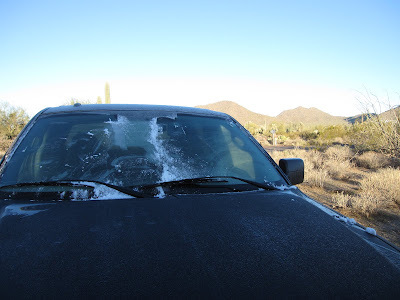 Another curious thing came to the low desert...frost. 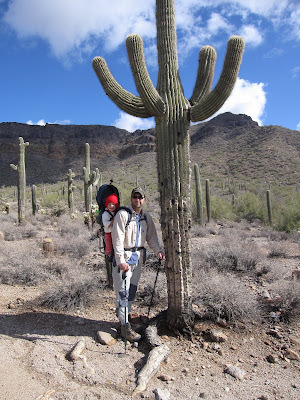 One thing that indicates you are in the Sonoran desert is the presence of saguaros. 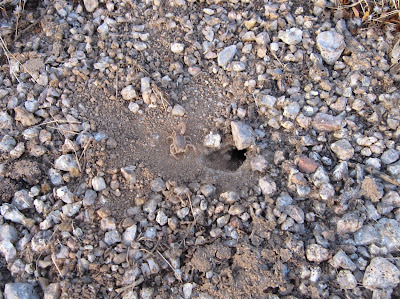 The range closely tracks the frost line, because they are damaged by freezing temperatures. But, we awoke to a frosty morning today. They can survive a little bit of it, but a severe cold will kill them. 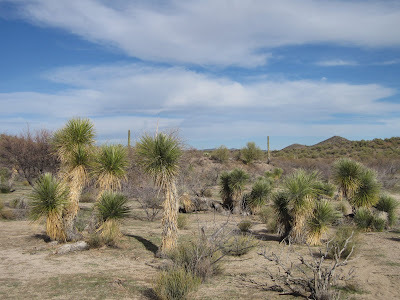 Another "frost line" exists down by Organ Pipe Cactus NM, where the organ pipe cactus literally dies with a single frost. So, they live in a region that never sees freezing temperatures. We were sitting there, preparing for the big storm, the winds were picking up and when I looked into the skies and say a crazy brownish-orange ting to the clouds. 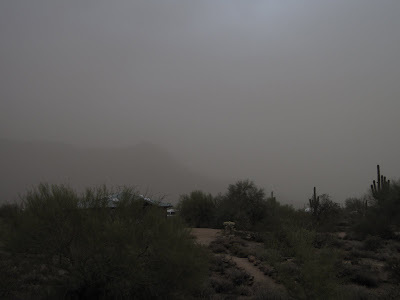 I thought to myself, that couldn't be a dust storm could it? The ground is wet, so where would it come from? Notice Pass Mountain has virtually disappeared in the dust cloud? The hue is hard to tell here, but it was a dusty brownish gray. Definitely different than a normal cloud. Then, the rain started falling and it actually started raining mud! 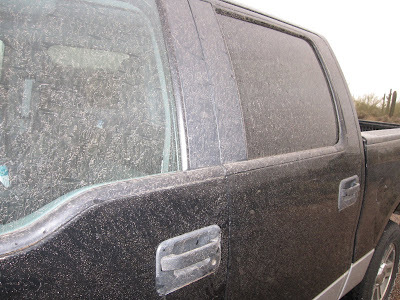 In minutes, the trailer and truck were coated in wet dust. Then, as the winds picked up, the "beep beep beep" of the Emergency Broadcasting System came on the radio. I had never heard anything other than the normal "test" before. They announced that a tornado warning had been issued for Maricopa County. 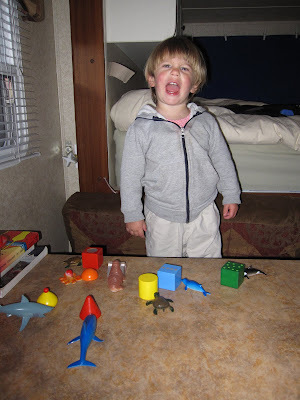 That was it, we sealed up the trailer and drove to Mesa to stay in a hotel for the night. 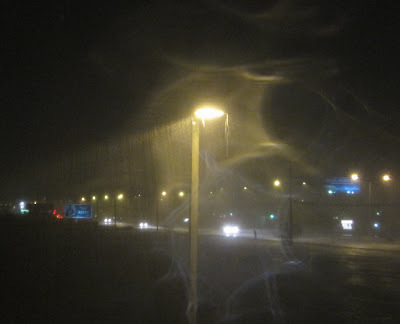 We weren't messing with 70 mph winds, 3-5 inches of rain, AND a possible tornado! 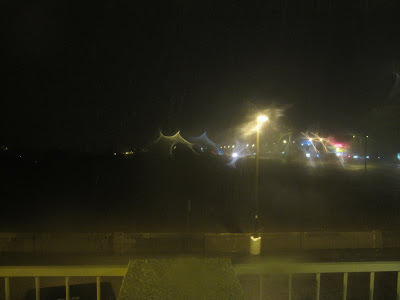 Hard to tell in this image from the hotel room window at 9pm, but the rain is falling as hard as I've ever seen it. I'm guessing at least 2 inches fell in the 15 hardest minutes. The news said 3.34" fell yesterday today and 5.78 for the week, surpassing the entire total of 2009! It was still raining in the morning when we woke up. Many roads and washes were flooded. They have closed many routes. We drove by parking lots that were lakes. But, I am amazed how this porous soil has been able to drain the water so quickly. 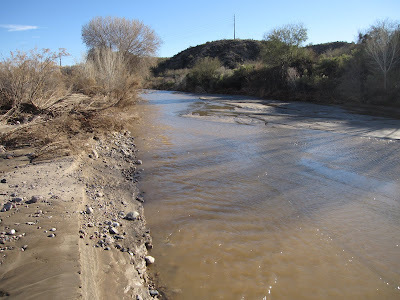 In fact, many washes had obvious signs of flooding (debris piled up and washed onto the roads), but were completely dry by late morning. 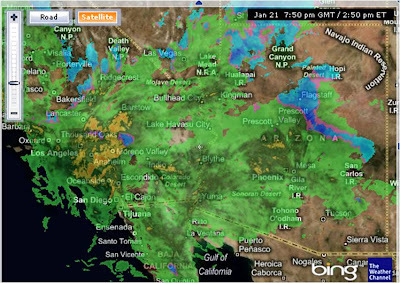 The third and most powerful storm is rolling through Arizona right now. 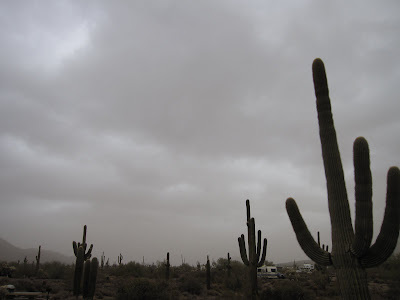 It is expected to drop 4" of rain in the desert (nearly as much as all of 2009 combined!) and 4 feet of snow on the Mogollon Rim. Constant rain, winds over 30-60 mph, flash floods, and pile of snow above 4000 feet has shut this state down. Linda ventured out with Hilina to the library this morning before the heaviest part of the storm arrived and already the roads were covered with water any place where a wash comes down. They have closed I-17 for a hundred miles between the Verde Rim and Flagstaff due to heavy snow. 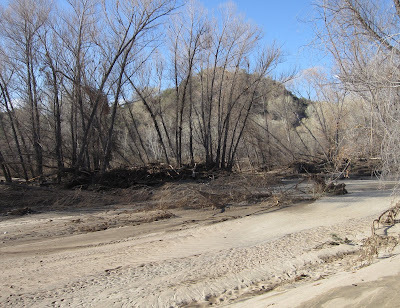 They are evacuating houses near washes and the Verde River is expected to have a flood 10-20 feet above its banks. 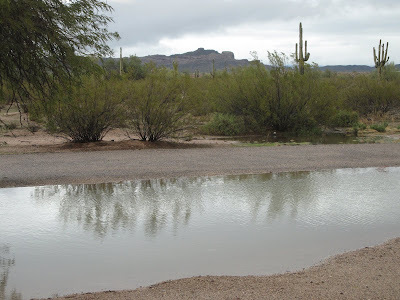 It could be the biggest floods ever to hit Sedona (Oak Creek) and the Verde Valley. As for us, we have battened down the hatches, sealed everything we can, and closed our slideout to prepare for the strong winds that are expected to arrive in the next few hours. Our trailer sure seems a lot smaller when the bed is slid in. 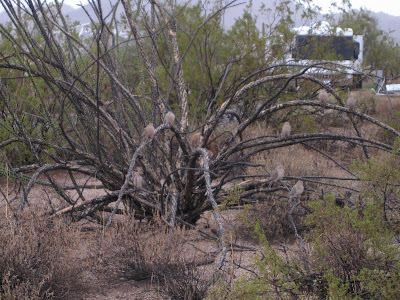 Here you can see some doves huddled up, trying to avoid the rains. 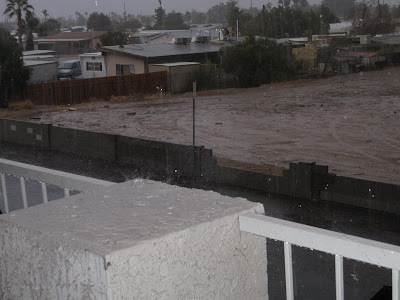 With El Nino in town, California and Arizona are getting near record storms. That is just a part of life in this region. The real question is whether these storms will also create the conditions for a near record wildflower year. That is something I eagerly await to see. But, for now, we just need to stay dry and warm and wait for the sunshine to return on Sunday. 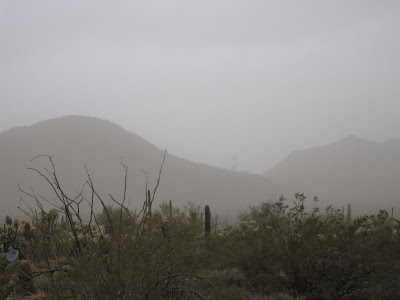 I will not be venturing out today to try and photodocument the flash floods or driving up to Flagstaff to see the snow. 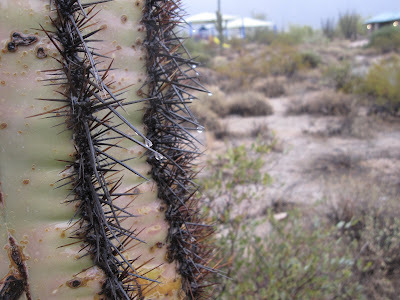 But, in the days to come I'll try and capture signs of that flooding (like logs piled onto cacti). Maybe we'll look for some snow next week or so...Stay tuned! 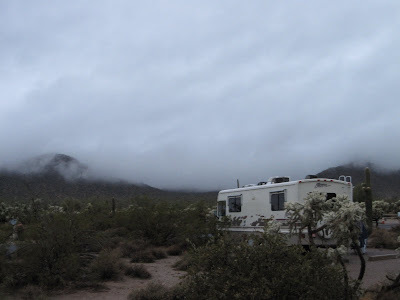 Sonoran Desert Rains...The Day After at "Wind Cave"
Last night, storm number two rolled past dropping a good inch of hard rain on the desert floor. 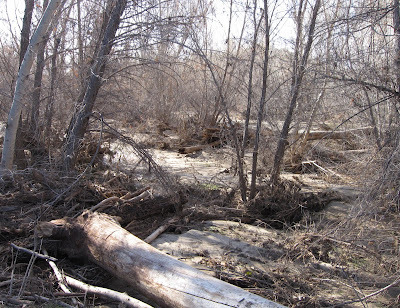 For a time, there was standing water on the ground, but by morning it has slowly seeped back into the rocky soil. With a 12 hour window before the 3rd and most powerful storm arrives, we decided to take advantage of the sunshine and head up Pass Mountain to the "wind cave". 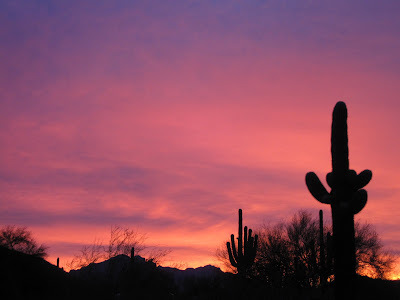 They are expecting that the next storm will drop as much as 3" of rain to the desert and perhaps 4 feet of snow in Flagstaff. Here is the sunset with the clouds moving in before the rains hit. 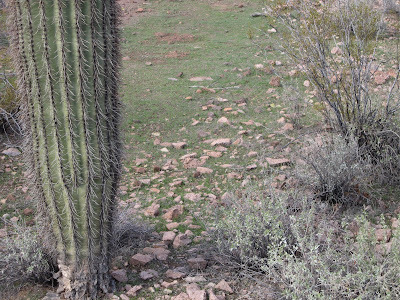 The large lateral roots of this saguaro have been exposed. Notice the runoff channel on the trail from the rains the night before. Hard to tell in this photo, but the lichens on the cliff walls were irredescent green after soaking up the rains last night. Pass Mountain is of volcanic origin. It is mostly weak granite with huge crystals, which indicates the magma cooled very slowly deep underground. 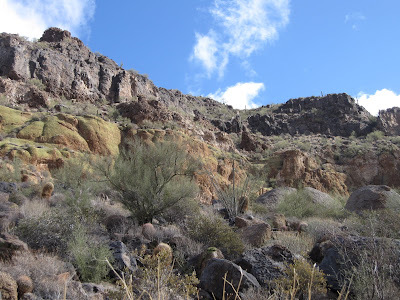 In the middle there is a thick layer of volcanic tuff, which is compacted volcanic ash from the massive Superstition eruptions about 35 million years ago. Again, the lichens were much more prominent in real life, but you can see that grayish-green on the rocks. The Wind Cave was just a carved out feature in the soft tuff, not an actual cave. Because the tuff layer soaks up the moisture better than granite, it is both softer and slippery when wet and a better substrate for lichens and moss to grow. 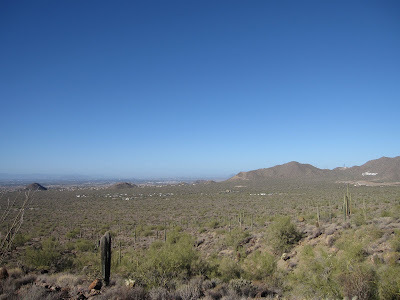 A view across the Valley of the Sun. 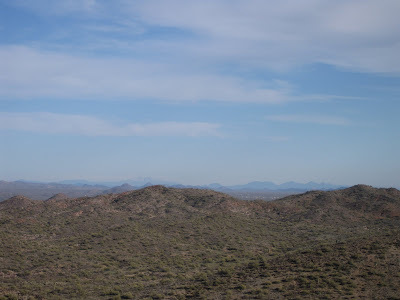 Downtown Phoenix is way off in the distance. Those white specks are the campground we are staying at. 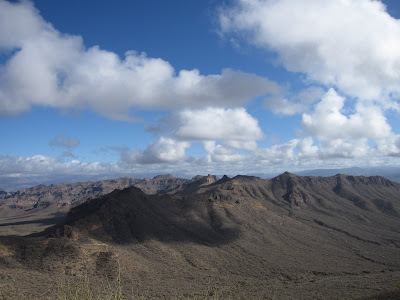 View from the Summit of Pass Mountain. 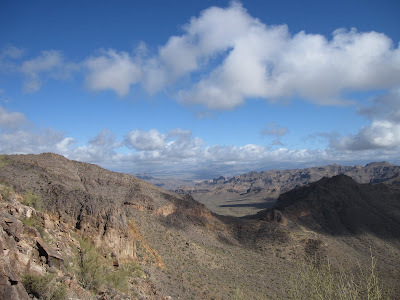 That saddle and zigzagging trail below is the Pass Mountain Loop that was featured earlier.